Offering you a complete choice of products which include chantix varenicline tablet, bupron tablet, nicorette chewing gum and nicotex chewing gum. We are one of the reputed organizations that are engaged in the importing and exporting high-quality Chantix Varenicline Tablet. Obtained from the reputed names of the market, these tablets are widely used for the treatment of nicotine addiction. These tablets reduce the cravings for the and other products. 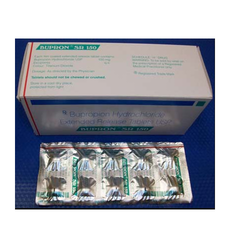 Supported by a team of highly experienced professionals, we are importing and exporting high quality Bupron Tablet. These tablets are accurately composed by the experts at our vendors’ end, using best quality chemical compounds and ingredients. Our valuable customers can avail these tablets from us in various packaging capacities. 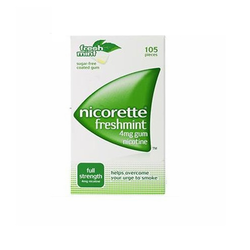 Our organization is a trusted name, which is engaged in the importing and exporting very effective Nicorette Chewing Gum. 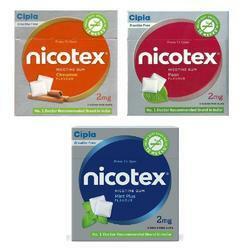 Sourced from the certified vendors of the market, these chewing gums are used for the treatment of nicotine addicts. It is known as nicotine replacement therapy (NRT) and helps smokers in giving up their habit of smoking. Owing to our rich experience and knowledge of this domain, we are importing and exporting best quality Nicotex Chewing Gum. The offered chewing gums are sourced from the certified names of the market and are used for the treatment of smoking addiction. Our valuable clients can avail these chewing gums from us at nominal prices. Abdominal pain, blurred vision, breathing abnormalities, cold sweat, confusion, diarrhoea, dizziness, drooling, fainting, hearing difficulties, heart palpitations, low blood pressure, nausea, pallor, rapid heartbeat, salivation, severe headaches, sweating, tremor, upset stomach, vision problems, vomiting, and weakness.